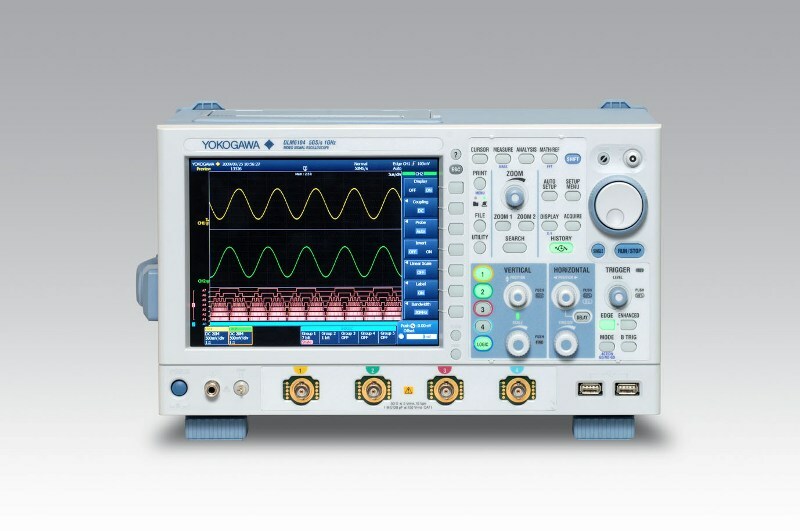 Yokogawa's new DLM6000 series digital and mixed signal oscilloscopes boast fresh physical and on-screen interfaces, based on extensive market research and user feedback. It incorporates dedicated, backlit buttons for the most commonly accessed settings, and unique Yokogawa controls, like the 5-way selector button and spring loaded ‘jog shuttle' control. Waveform update rate determines your probability of catching an intermittent glitch. On other mixed signal oscilloscopes, enabling the logic inputs severly impacts waveform update rate. The DLM6000 maintains waveform update rates so you can detect abnormalities and transients in your analog or logic channels. After measurement has stopped, you can review past waveforms individually for detailed analysis. 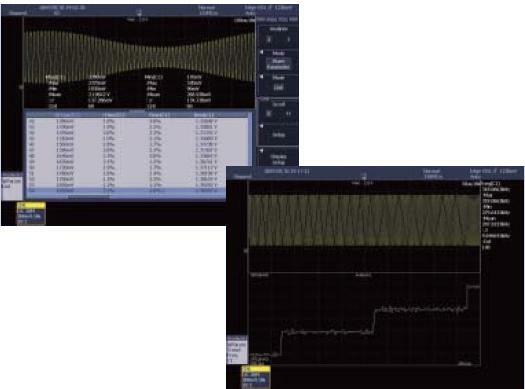 On most oscilloscopes, to observe and analyze abnormalities such as unpredictable noise in detail, you have to devise clever trigger settings and re-measure the event. 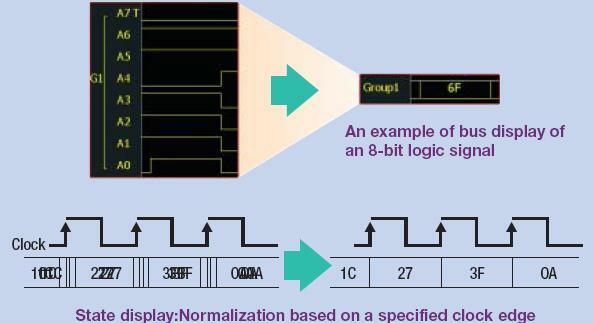 But with the DL6000/DLM6000 there is no need to re-measure the phenomena because once the event occurs, you can use the History Memory function to recall past waveforms that were originally displayed on screen. SD card bus commands are sent intermittently, and the non-signal portions of these waveforms do not need to be analyzed. To be able to capture the commands that you want to observe from such signals, you can set a serial bus trigger and use the History memory to acquire up to 2000 of the waveforms that match the trigger conditions into History memory while ignoring the non-signal waveforms. Rather than acquiring a single waveform to the entire acquisition memory, you can acquire multiple waveforms of only the needed command, and analyze them. Quickly extract locations and abnormalities you wish to analyze from the acquired waveform data, and zoom in anywhere on waveform details. 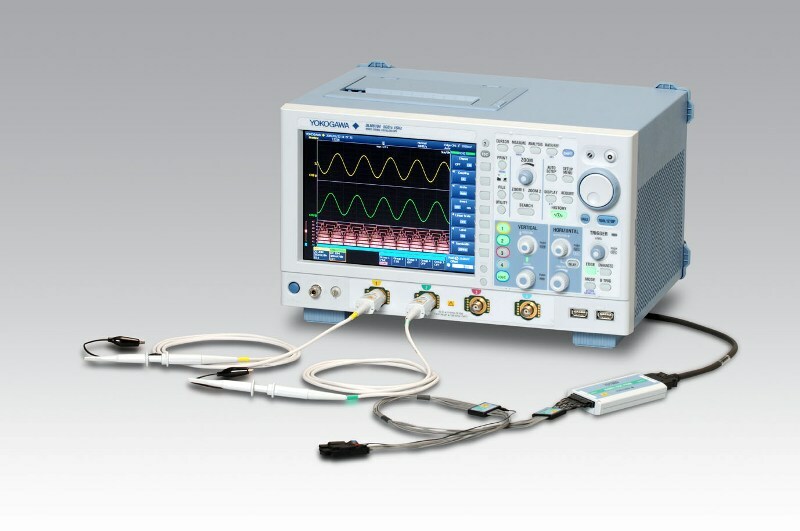 The DL6000/DLM6000 series has enhanced Search and Zoom functions for searching for desired portions of waveform data and observing those waveforms in detail. The search function can search both analog and logic signals in History Memory (History Search). waveform areas with different time axis scales at the same time. Intuitively adjust the zoom factor with the zoom knob, and the scroll with the jog shuttle. You can also scroll the zoom window automatically with the Auto Scroll function. Display the statistics on the automated measurement values of waveform parameters. Simply select the check boxes of parameters you wish to measure automatically in the setting screen's parameter list. Simultaneously measure up to 16 parameters during acquisition. Additional measured values can be obtained in the analysis screen, or via PC communication. You can measure waveform parameters of every cycle of a periodic waveform, and display results in lists and trend graphs. This is useful when evaluating period-by-period waveform fluctuations or loss in switching circuits. The DLM6000/DL6000 can restrict filter out unwanted high frequency noise and expose only the frequency bandwidth of the signals you are working with. Every analog channel offers independent, real-time bandwidth filters. 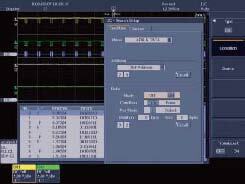 Digital oscilloscopes have offer excellent time resolution. 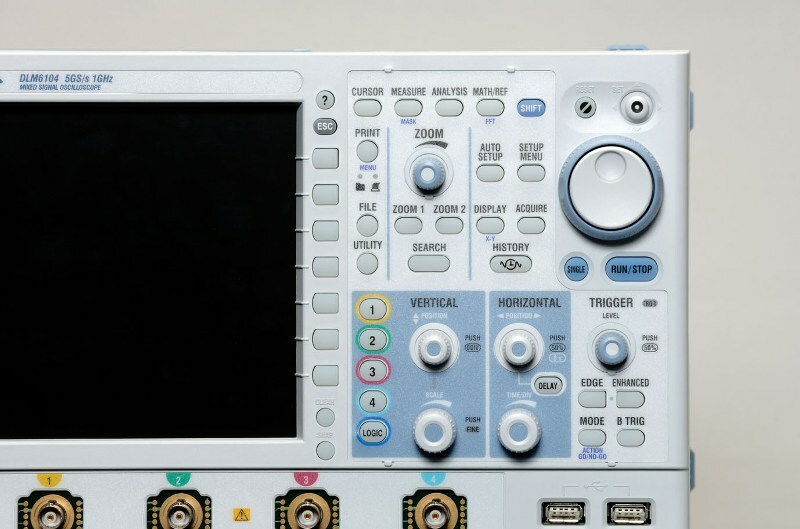 However, nearly all digital oscilloscopes provide only 8-bits of vertical (voltage) resolution. 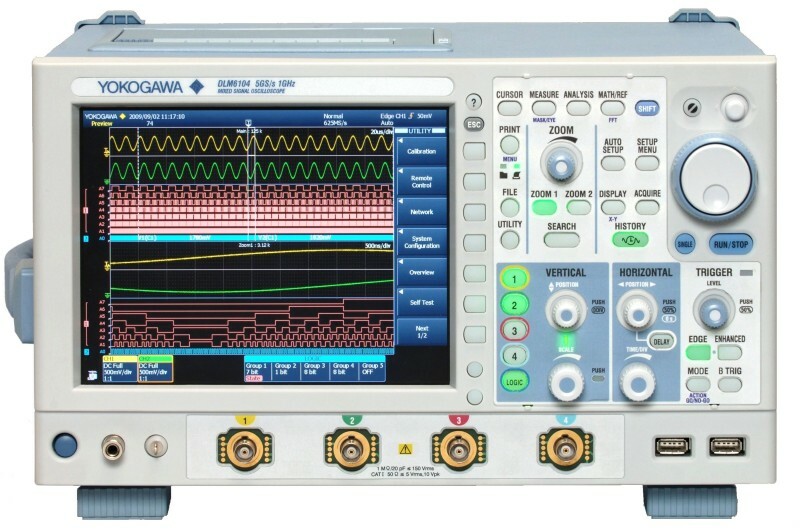 With Yokogawa's High Resolution mode (real-time FIR filter), the oscilloscope will oversample and reconstruct a higher resolution signal with resolutions of up to 12 bits. Unlike averaging, High Resolution mode does not require a repetitive signal and works on single shot acquisitions. When measuring SMPS waveforms, highly precise evaluation is impossible due to the insufficient dynamic range offered by 8-bit oscilloscopes. In such cases, you can use High Resolution mode to raise the precision of the waveform as well as of any computed results. To easily isolate specific waveforms, the DL6000/DLM6000 offers a variety of application-oriented triggers, from simple edge triggers to pulse width, multi-criteria combination and time difference triggers. When your test involves waiting for intermittent phenomena, you can use the Action On trigger function to automatically save waveform data to file when trigger conditions are met. You can also send e-mail notifications on every trigger. Even for phenomena that occur only once per day or less, you can be sure that a record of the data, including the date and time, will be kept. Observing many signals simultaneously and checking their correlations and timing is an effective means of verifying increasingly complex embedded systems. With the DLM6000 series, you can measure up to 32-bit logic signals and 4 channels of analog waveforms simultaneously, and investigate hidden data in waveforms using bus analysis and computation functions. regardless of the bit arrangement of the logic probe. This means that even if pin assignments or signal arrangements change, you only need to change settings rather than to repeat the probing of the circuit. clock signals in a State display. Therefore, parallel output values of an address bus or A/D converter can be read directly. 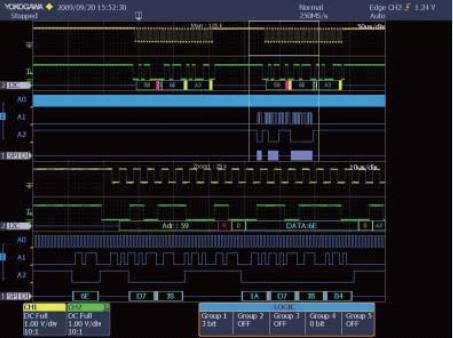 Functions like these make analysis of logic signals easy, so that operating checks of the device under test can be performed more quickly and accurately. 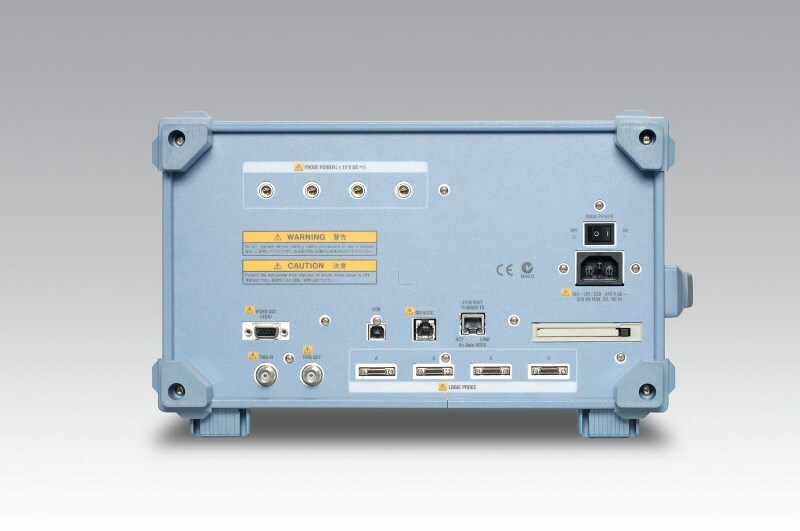 The DL6000/DLM6000 includes a Virtual D/A Computation function, in which address bus signals or logic signals from data converter I/O can be converted to analog waveforms and displayed. You can display logic signals output from an A/D converter, and by comparing them with the original analog waveforms prior to conversion, you can investigate the general dynamic characteristics of the A/D conversion. Displaying the address bus signal as a waveform is also useful for identifying instances of abnormal memory access. D/A converted waveforms can undergo FFT analysis or have additional digital filtering computations applied to them. There are two different types of logic probe that can be used with the DLM6000, depending on the application. The model 701989 is a 250 MHz logic probe with a tip shape designed for probing circuit boards. In addition to probing with the pincher tip, the tips can be stacked in the included holder, making it easy to connect to and disconnect from a 2.54 mm pitch box connector. The model 701988 is a 100 MHz general-purpose logic probe with an impedance of 1 MΩ. Its high impedance gives it characteristics that make it difficult to influence the behavior of the target. Aside from pincher tip probing, the head with the tip removed can also be connected to a 2.54 mm pitch diameter connector. You can add on I2C, SPI, CAN, LIN, and other serial bus-specific trigger and analysis functions to your DL6000/DLM6000 series instrument. 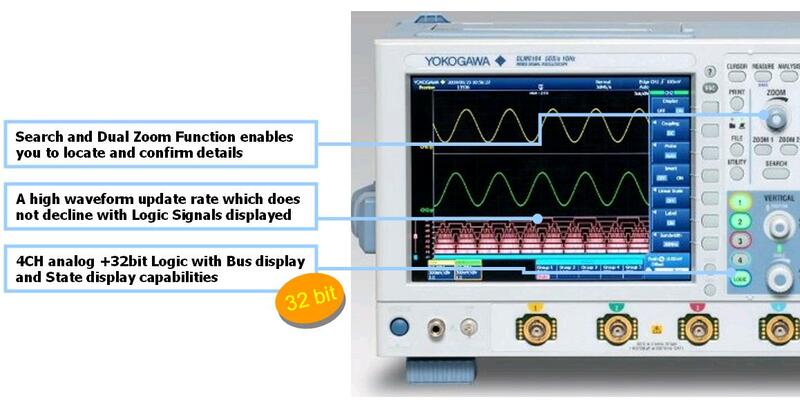 With these functions, you can trigger on specific serial bus parameters, and display the waveforms along with protocol analysis indicating the decoded serial bus information. 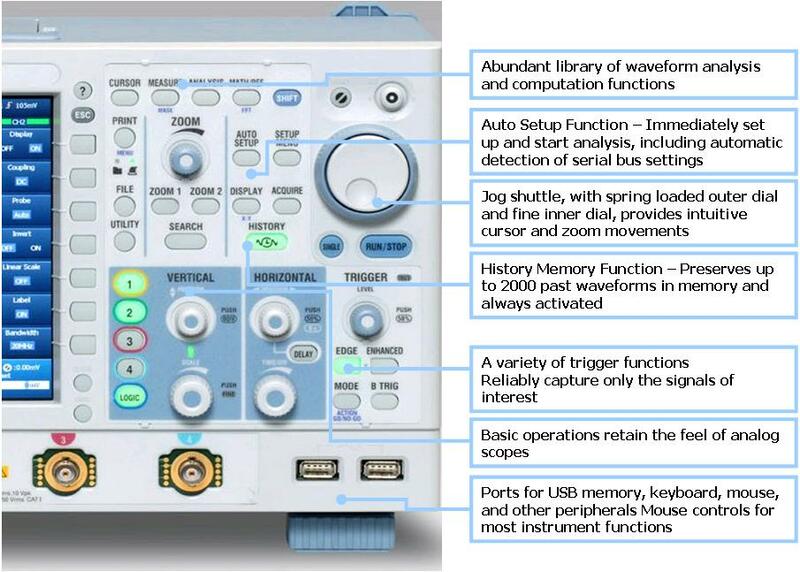 Moreover, the DL6000/DLM6000 series also comes with a "Serial Bus Auto-Setup" function to eliminate the tedious task of entering settings when starting the analysis. The DL6000/DLM6000's serial bus analysis function simultaneously displays these three pieces of information on screen in real time. 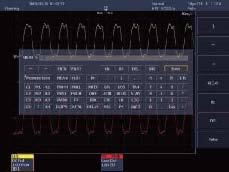 You can link the protocol information with the waveform information, select data in the protocol list, and automatically display the corresponding part of the analog waveform. Check the protocol list to see whether transferred information is correct. If not, you can determine whether there were any electrical problems at the waveform level. In operational analysis of systems that include serial busses, this can be very useful for sorting out hardware from software problems. 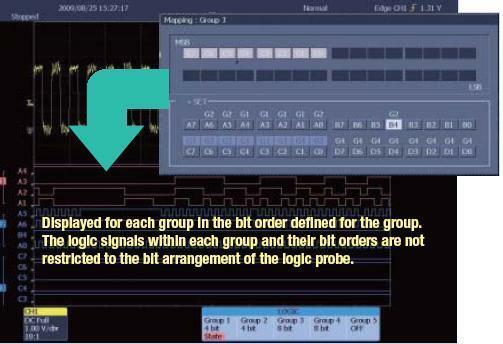 Both analog and logic inputs can be used for serial bus analysis. Also, two different serial busses can be analyzed at the same time. For example, you can analyze a CAN and LIN bus simultaneously, or use an MSO to analyze two SPI busses at once. You can trigger on specific data sent to a motor controller on an I2C bus and capture the waveform. Then, you can observe and analyze the content and timing of the data, plus the behavior of the activated motor. Together with that, you can use an MSO to observe control circuit logic signals, enabling you to evaluate the overall system. Digital filters, integrals, edge, rotary count, logic signal DA conversion computation, and FFT computation functions come standard. As these computations are hardware-based, results appear on screen quickly. 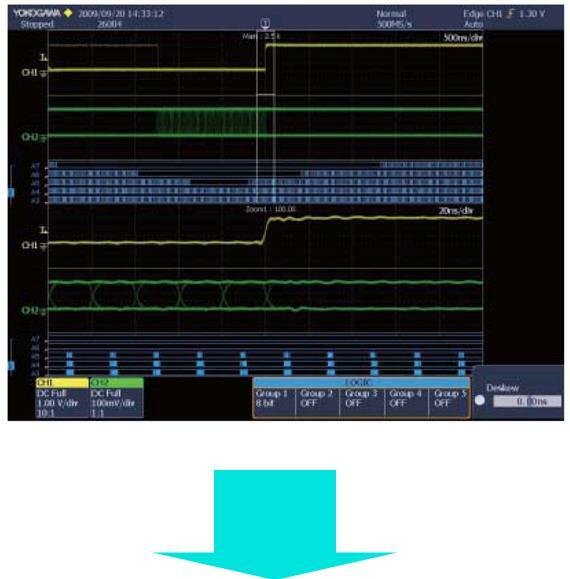 Even computations that traditionally needed to be sent to a separate PC for processing can now be executed at high speed on the oscilloscope, thus greatly reducing the time and effort involved in computing and analyzing waveform data. Digital filters, integrals, edge, rotary count, logic signal DA conversion computation, and FFT computation functions come standard. As these computations are hardware-based, results appear on screen quickly. 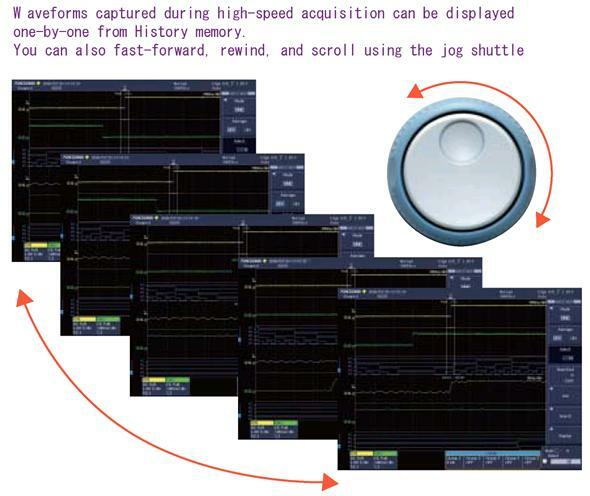 Even computations that traditionally needed to be sent to a separate PC for processing can now be executed at high speed on the oscilloscope, thus greatly reducing the time and effort involved in computing and analyzing waveform data. 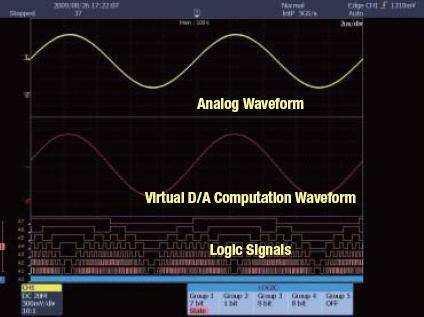 You can perform FFT computation for analog signal waveforms or DA computation waveforms. This includes not only signal spectra, but also coherent and transfer functions. 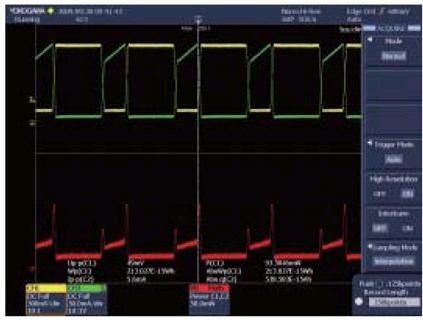 By using combinations of differential and current probes, you can evaluate switching loss or analyze safe operating area (SOA) in power supply waveforms. 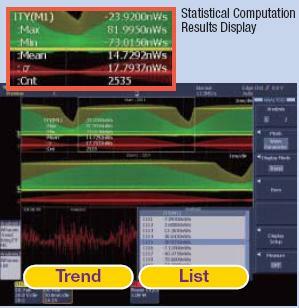 Through statistical computation you can also measure multiple switching waveforms and display loss on a per-week basis in lists and trends, or display statistics on aggregate loss of up to 2000 switching waveforms stored in History Memory. If precise calculations are required, a correction function and High Resolution mode are available. It can be extremely useful to check for fluctuations in switching frequency or voltage modulated by the commercial power input voltage on screen, at the same time as the waveform of that input voltage. Fluctuations in cycle-by-cycle loss, peak current, and other phenomena can be checked in lists and trend graphs thereby allowing you to identify excessive changes from power-ON to stable operation. 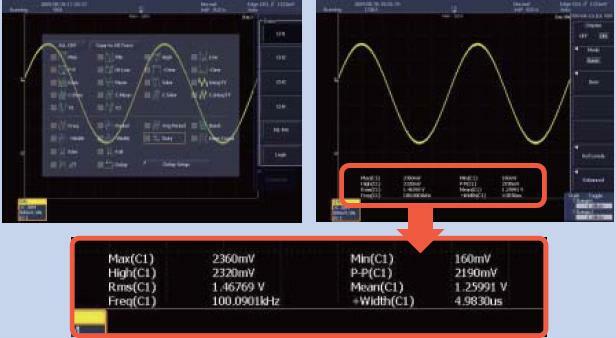 Bar graphs and lists of harmonics can be displayed together with the appropriate limits for the device under test as defined by the IEC standard (supports device classes A-D). Any measured value which exceeds the limit is highlighted.